The Yasukuni Shrine -- Japan's national memorial enshrining the spirits of Japanesesoldiers killed in domestic and foreign wars -- occupies a peculiar chapter in Japanese history. Originally designed as a sanctuary to house the spirits of those who died in overthrowing the Tokugawa Regime, Yasukuni was nurtured by the state and then the military into a powerful religious and iconographic center to promote Japanese ultranationalism. Following the close of World War II, the Shrine became the subject of intense politico-religious debates as the Japanese, with the assistance of the international community, consigned themselves to the task of finding a place for Yasukuni as they worked on their postwar project of reinventing nationalism and cultural identity. 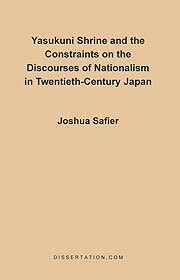 This thesis provides a narrative review of Yasukuni's history from its inception to the present, focusing on the critical years of 1985-1986, when Prime Minister Nakasone Yasuhiro sanctioned a commission to settle the Yasukuni problem. This study also represents one path in a quest toward a deeper understanding and definition of postwar Japanese nationalism and identity.